The shadow of the Thirty Years War hit the British Isles in 1625, as Charles I became King of England. Accustomed to a weaker Scottish Parliament, the new King found fiercer opposition from the Parliament in London. Now, only two decades later, open war has started with the Royalists facing the Parliamentarians, and the conflict is raging in England and Scotland. The Country is at odds, its population forced to take a side and torn apart by religious divisions. No one can be neutral this time. To whom will you swear your loyalty? To the King or to the Parliament? A new game from Ageod is in the development, and it will focus on the grim years of the English Civil Wars (1642-1651)! Two playable factions, Six scenarios, Historical Events triggered throughout the game, Regional Decision Cards, all of this and more, will make you relive the wars that laid the foundation of the British Empire. 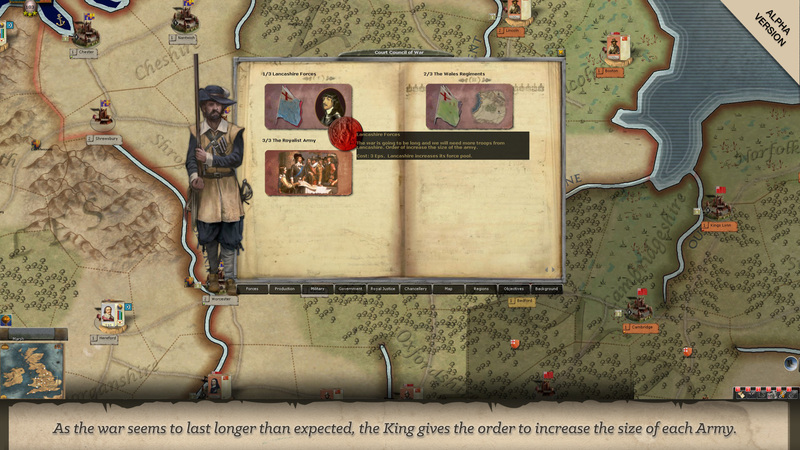 Re: Ageod Announces English Civil War! Does this game use the traditional Ageod system? Or the new system? vaalen wrote: Does this game use the traditional Ageod system? Or the new system? It uses the traditional AGEOD engine. Great! Really looking forward to it. Excellent news. I shall definitely be getting this one. The colours and the design look fabulous. Is "Freeborn John" (Lilburne), a famous Leveller going to be in it? And Gerard Winstanley and the Diggers ("True Levellers")? It is the declaration of lex tallionis, so he is in some way represented. As soldier he wasn't so relevant to be represented. Only most important leaders are, to avoid have more leaders than units. And the related wiki site with regiments lits. Will the Marquis of Montrose be in it? And will there be a scenario about his "year of miracles"? Regardless, I am in, of course. Will the battleplans include defensive deployments in the pitched battles ? 5there weren't any in TYW). Will you keep the emprisoned leaders' feature of TYW ( with the ability to relieve them with a card) ? Will there be a lot of political or religious choices ? What will be the supply system ? The same as TYW ? It seems a very interesting game. Thanks a lot. Is there an approximate release date ? The current AGEOD engine should work fine in recreating "this war without an enemy." I hope the game includes both Scotland and Ireland. I still remember my dissapointment when I realized that Unhappy King Charles didn't include Montrose's campaign. Including Ireland would show you, in a very graphic way, where Charles' 'Irish' troops are coming from and why they exist. Apart from that, how many of the three English Civil Wars are covered? Leibst wrote: It is the declaration of lex tallionis, so he is in some way represented. As soldier he wasn't so relevant to be represented. Only most important leaders are, to avoid have more leaders than units. I was thinking more along the lines of political events really, a bit like in "Revolution Under Siege" where you might make decisions/concessions to raise morale (or pacify people) by adjusting your social policy (e.g. land reform). So in the ECW there might be considerations about dealing with Leveller unrest in the army, for example, or the emergence of Digger communities in various parts of the country. I wasn't expecting Lilburne or Winstanley to be represented by actual leader figures. Fantastic! I am so happy to see this being done. I will indeed be purchasing this! I just hope it will be as hard as Thirty Years War ! Death to easy supply system ! Sruba wrote: I just hope it will be as hard as Thirty Years War ! Absolutely true. And there are a lot of fine points you have to pay attention to or your army will melt away and lose its ability to fight. And this adds so much immersion to the game. This project sounds exciting. I wonder if the game will include the American theatre? Maybe an off-the-map box. During the Civil War, there were four colonies: Virginia, Maryland, Connecticut and Massachusetts. New York and Pennsylvania did not yet exist being New Netherlands and New Sweden respectively. Virginia and the Catholic colony of Maryland were Royal supporters. Massachusetts and Connecticut were Puritan and supported Parliament. Virginia Parliament supporters were kicked out of the colony. They went to Maryland, where they founded Providence, which later became Annapolis. In 1645 the Maryland Puritans captured the capital, St Mary's and in 1646 the Catholics recaptured it. The last battle of the English Civil War was fought in Maryland. The Battle of the Severn was fought in 1655 and the Parliamentarians won. There were no large major battles, but maybe this could be included as flavour. I believe this would make nice flavor events, as the North American theater is not in the game but the flavor/feeling would be great. Would you be able to write a few descriptive texts for those events and provide the dates? This is great news, have been hoping that Ageod would do a ECW game for a very long time. Good news for a little covered time period. However, the other side of me wishes one of the current games is fixed so that it is playable. To me, as a solitaire player, Wars of Napoleon is completely unplayable in its current condition. I hope there is a fix in the works. PhilThib wrote: I believe this would make nice flavor events, as the North American theater is not in the game but the flavor/feeling would be great. In 1644 a violent family feud broke out in Maryland between the Calverts and the rival Claiborne family, over some land that the Claibornes thought should belong to them but the Calverts had occupied. The conflict was intensified by religious and political differences, because the Claibornes were Puritans, and attracted support from those opposed to the Royalist, pro-Catholic Calverts. Two or three years of unrest and low-intensity warfare followed. There was also naval conflict in the north. The fishermen of Newfoundland were Royalist, and fought several skirmishes at sea with New England merchant ships. This was nothing new - privateering was a way of life for many mariners, and the English, Scots, Irish, Dutch, French, Germans and many others all participated enthusiastically. In 1651, Parliament sent General-at-Sea George Ayscue with seven warships to ensure its control of the American colonies. Ayscue encountered armed resistance at Bermuda, and had to spend several months blockading the island and landing raiding parties until its governor surrendered. When he arrived in Virginia and Maryland in March 1652, however, the colonies gave up without a fight. There would, however, be further conflict in Maryland. The governor, William Stone, was allied to the Royalist Calvert family, but he was a moderate and so was allowed to remain in office subject to the oversight of several Parliamentary Commissioners (including William Claiborne). In 1654, however, Stone resigned his office - only to return a few months later with troops in an attempt to regain control over Maryland by force of arms. The result was the Battle of the Severn on 25 March 1655, fought near present-day Annapolis MD. The 'battle' lasted half an hour and involved no more than 300 people on both sides combined; a total of 19 men were killed. Stone lost the battle and was taken prisoner - he was sentenced to death for treason, but was pardoned and allowed to live out his life in retirement. Parliament retained control of Maryland until the Restoration.